Energized Web Hosting Review 2019: Is Energized Web Hosting a Good Hosting? Founded in 2009, Energized Web Hosting provides shared, reseller and VPS hosting using their three super-fast and secure data centers. Although located in the United States, they offer hosting services and support in up to ten languages as well as English. Energized Web Hosting is a Christian owned and operated web hosting company that was established in 2009. With top tier data centers in Buffalo, Chicago, and Dallas, they serve clients all around the world. They’re committed to providing the perfect blend of affordability, flexibility, and reliability to help meet customers’ needs. Their website can be switched between ten different languages, but it’s hard to tell if these are merely Google plugin translations. Energized Web Hosting’s range of services includes shared hosting, domain registration, reseller hosting, and VPS (both unmanaged and fully managed). They also cater for specific needs with features for Christian-based businesses and WordPress websites. 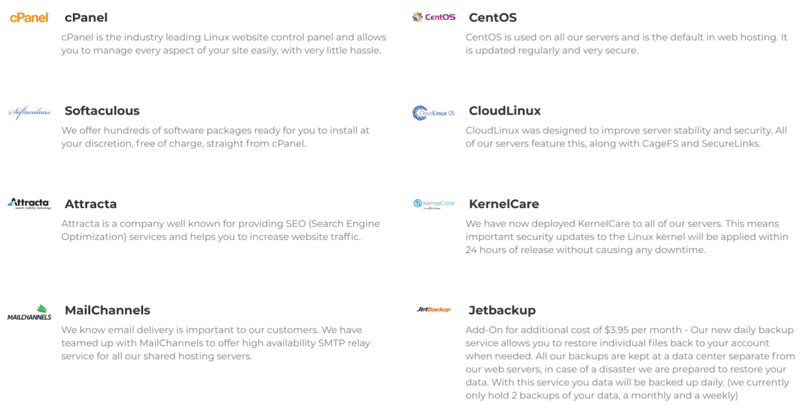 Their shared hosting comes with the Softaculous installer in the cPanel control panel, allowing you to install popular CMS software such as WordPress, Drupal, Joomla, and Magento in one simple step. They don’t provide a website builder, which may be because they offer web development services. Experts will enjoy the full CGI script access plus support for MySQL, PHP, Perl and more, including Attracta SEO tools and KernelCare for automated security updates to the Linux kernel. Energized Web Hosting’s shared servers use CloudLinux (with CageFS and SecureLinks) to improve server stability and security and to allow you to fully utilize your resources without affecting other users on the same server. Their use of HDD storage is supposed to change to the faster and more reliable SSD sometime soon. Hosting plans include weekly automatic backups, but you can buy JetBackup for more frequent backups. You can also buy an SSL certificate or use the free Comodo SSL that is set up automatically. One challenge I had was with the company’s website, which led me to HTTP 404 (page not found) error pages when I clicked some links. It’s not the best endorsement for a web hosting company, is it? Energized Web Hosting’s packages come with various monthly and annual plans that offer great value for your money. Although they are ostensibly slightly expensive, you get what you pay for in terms of software and hardware resources. There is no free trial or discount with this company, but there are no hidden fees, and you do get a 30-day money-back guarantee. You can get 24/7 technical support by live chat or ticket, and you can call the company during standard working hours on weekdays. I got a rapid and resourceful response when I contacted them via live chat. If self-support is more your thing, you can check out their knowledge base. With three state-of-the-art data centers in the United States, Energized Web Hosting’s services are great for both small and large business websites. Christian ministries and anyone in Iowa will be particularly interested in this provider. Wondering how Energized Web Hosting stacks up against other Web Hosting companies? Enter any other Web Hosting company and we will give you a side-by-side comparison.